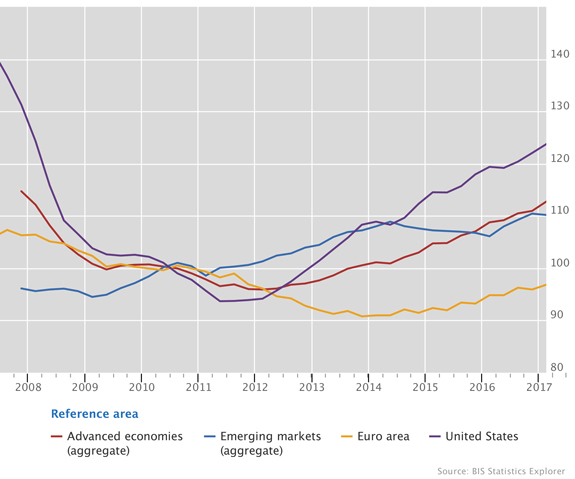 The detailed data set of nominal residential property prices consists of around 300 series from 60 countries, collected from national central banks. The data set is updated monthly. What you will have to know: Land is cheapest where there is a Problem with the economy. Right now this is true for: Greece, Russia, Spain, Italy, Brazil(? ), East-Germany… And many more. So of course: if you add up the massive speculation driven house prices of Munich (West-Germany, +70% overpriced) and the property prices of East-German Saxon where you can buy a old house for 5000€ because of lack of jobs, than you come up with a slight increase in houseprices in Europe completely ignoring regional massive differences.